The Persona is the gray mask covering the entire palm. The shades of gray indicate the moving from public/Ego to private/Shadow. Consciousness relates to the 5 digits. Ego = opposing thumb to index finger in particular, and to the other digits. Self according to Jung is at the center. Here I've made it the entire palm, but especially focused centrally. Personal self is on the radial side. Unconscious self is on the ulnar side. Animus/Anima is on the Thenar mount. Shadow is on the Hypothenar mount. Collective Unconscious rises from the wrist and heel of the palm. Outer World is on the radial side. Inner World is on the ulnar side. 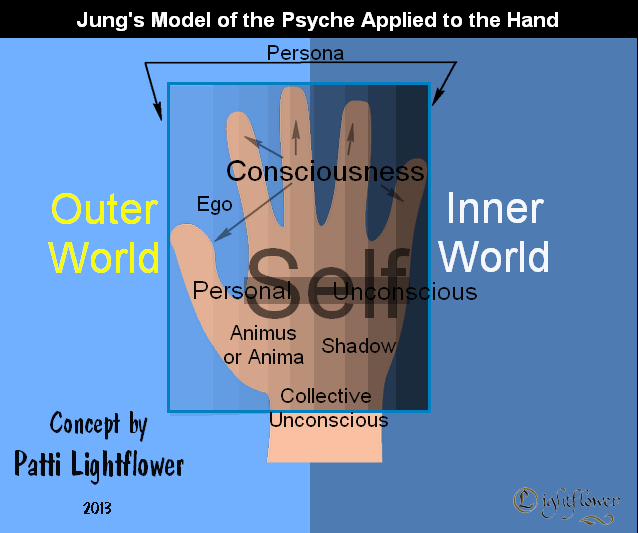 Jung never presented any 'hand model' for the psyche, therefore I think your title can induce some confusion... because this actually concerns your model for the hand (based on your perception of Jungian psychology). PS. Patti, some of the elements (e.g. Persona) inside your picture do not have any connection with the hand reading literature. Also, in the picture that you presented in the other topic we can see that Jung does not describe the Shadow, Animus & Anima to be positioned inside the Persona (the persona was actually described by Jung the represent a conscious part of the mind, while the Shadow, Animus & Anima represent unconscious elements of the mind). Yes, I noticed that after I had completed it. That is why I added that the concept was by me. I'll probably adjust the title later. Actually that is not true at all. 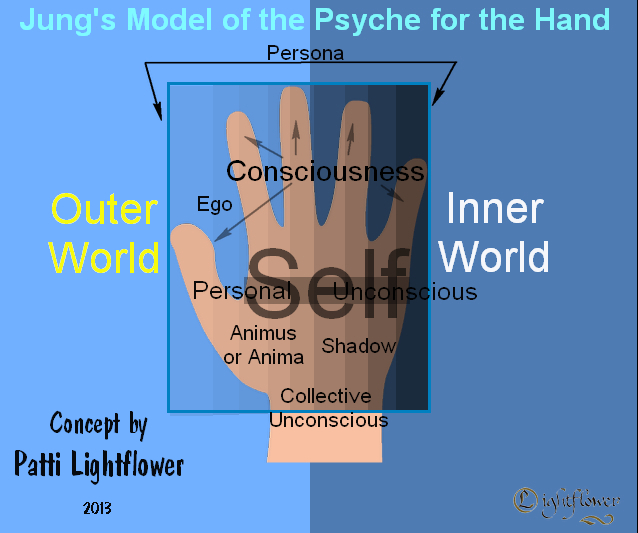 I presented the graphic "Jung's Model of the Psyche" and was inspired to see how it overlayed on the hand. Apparently you were inspired also. I didn't see your attempts at matching the graphic to the hand until I came back to the forum 2 hours later and uploaded my completed model and then saw that you had also been inspired and had uploaded your model an hour earlier. My graphic has nothing whatsoever to do with yours. 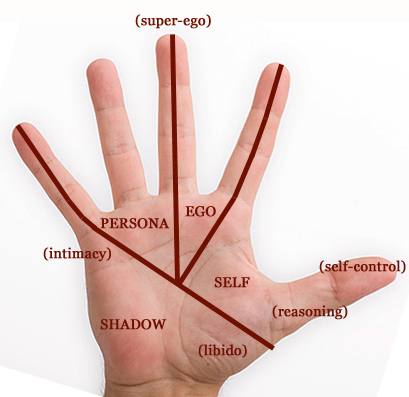 However it is obvious that yours is your representation of how you would apply Jung's Model of the Psyche to the hand. Okay Patti, thanks for describing what made you create your picture. By the way, I hope you will respond to my main point of feedback regarding the location of the Persona inside your picture. I see the energy of the hand as non-linear and multi-dimensional. The persona is the mask to the outer world. Okay, that sounds fine with me. But you still haven't explained why you positioned the Shadow, the Animus, and the Anima inside the Persona...? 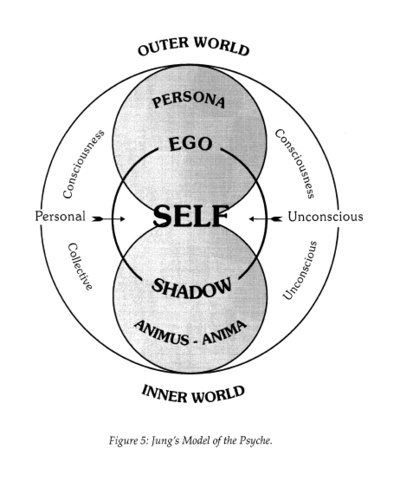 Again, Jung's model describes that the Persona should be located inside another part of the psyche than the location of the Shadow + Animus + Anima. Self is in the center and interacts with all other aspects of the psyche. The personal self is on the radial side of the hand and relates to the outer world. The unconscious self is on the ulnar side of the hand. A vertical division illustrates the radial outer side and the ulnar inner side of the hand. 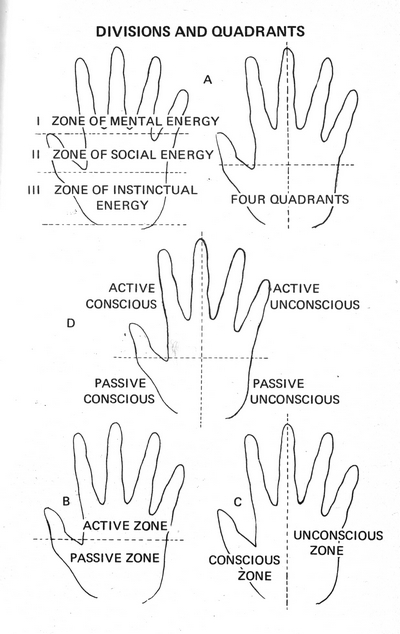 Consciousness includes the fingers and moves towards Self in the mounts below the 4 digits at the distal part of the palm, and Collective Unconscious is at the bottom of the palm. Ego is a part of Consciousness. 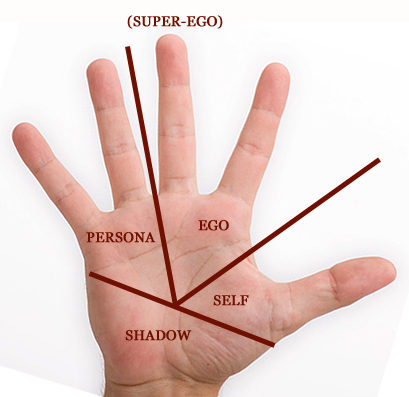 Underneath the gray horizontal bar in the zone leading toward the Collective Unconscious is the Animus/Anima and located on the Outer side of the hand and on the ulnar side is the Shadow. The horizontal gray bar could also be visualized as simultaneously vertical with Personal at the top and Unconscious at the bottom. The persona, being the mask, is thinner at the radial side of the hand and gradually becomes denser, darker and deeper as it moves to the percussion toward the inner world. This fits in well with my own understanding of the hands as well as working perfectly with Judith Hipskind's graphics. Sorry Patti, your model suggests that the full hand can be understood as the 'Persona'... and that all other functions of the psyche are positioned INSIDE the 'Persona'. However, that does not reflect how Jung described the 'Persona': Jung described the 'Persona' to represent only a small part of the psyche, and in Jung's model the 'Persona' does not include any other functions of the psyche. 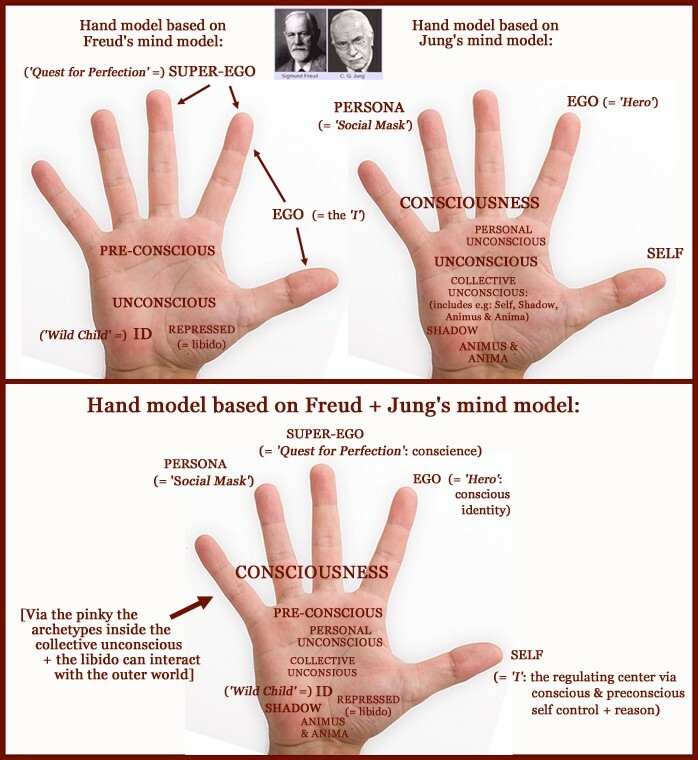 So, therefore I think that your hand model can not represent Jung's model of the psyche. the PERSONA are most accessible for others (= the outer world)! Thanks for sharing your ideas about Jung's Model for the Psyche as applied to the hand. Here's a link to my blog post that I've just completed so this is a final draft that I'm still proof reading for typos. It describes how I have applied Jung's model. Jung describes the persona as that which one is not, but which oneself and others think one is (CW 9/1, par. 221). It is a functional complex that comes into existence for reasons of adaptation or personal convenience but is by no means identical with the personality. The persona is exclusively concerned with the relation to objects. The shadow is everything an individual refuses to acknowledge about himself (CW 9/1, par. 513). Qualities perceived as undesirable, unacceptable, or reprehensible are repressed or hidden from view in the shadow, the polar opposite of the persona. I understand this to indicate that the persona is the outward face or mask. It's task is working with the outer world. In the paradox of Jungian theory, opposites have the seed of the other inside themselves. Remember the yin/yang symbol. Here the author writes that the opposite of the Persona is the Shadow, but I think the opposite of the Persona is both the Anima/Animus and the Shadow. The things of the Personal Unconscious and the Collective Unconscious are not out in the open and visible. The Persona hides all the layers beneath it, some of those layers already hidden behind the self in the Unconscious and the Collective Unconscious. A result of the tension between these polarities might be 'behavior'. "In Jungian psychology, the shadow or "shadow aspect" may refer to (1) the entirety of the unconscious, i.e., everything of which a person is not fully conscious, or (2) an unconscious aspect of the personality which the conscious ego does not recognize in itself." "Jung also believed that "in spite of its function as a reservoir for human darkness—or perhaps because of this—the shadow is the seat of creativity; so that for some, it may be, 'the dark side of his being, his sinister shadow...represents the true spirit of life as against the arid scholar'"
I think this illustrates that my choice to associate the shadow with the hypothenar (mount of moon) makes at least sense regarding the aspect of creativity (imagination) - because while creativity often gets associated with the ring finger... I associated the seeds of creativity with the mount of moon (and the expression with the ring finger). And nice to see you associate it with the hypothenar as well! You have described where the 'collective unconscious' begins (at the wrist/heel of the palm)... but where do you perceive it to end? Ok, I wondered why you used the illustration with the boxes as the author had a different view than you were illustrating. Yes, most of the graphics show the Shadow as the polar aspect of the Persona. It's ancestral and collective. It could be cultural collective as well. It extends into this past and common human resource that is likely endless. Here is a sketch drawn by Jung illustrating the Collective Unconscious. He described it as the fire within, a resource. So, to answer your question, I don't see it as ending and that is why I placed it partially beyond the persona at the base of the palm and wrist. Patti, thank your for your answer. Regarding the content of your answer: if you don't see the Collective Conscious as ending.... this implicates that in your view the collective unconscious is everywhere where the conscious- and unconscious elements are. Sorry Patti, but that is now how Jung described the Collective Unconsious (and the 'landscape' picture also does not suggest this at all). Even though all important words used by Jung are present inside your picture, the topography of these features inside your picture do not reflect how Jung has described them. "A more or less superficial layer of the unconscious is undoubtedly personal. I call it the "personal unconscious". But this personal layer rests upon a deeper layer, which does not derive from personal experience and is not a personal acquisition but is inborn. This deeper layer I call the "collective unconscious". I have chosen the term "collective" because this part of the unconscious is not individual but universal; in contrast to the personal psyche, it has contents and modes of behaviour that are more or less the same everywhere and in all individuals." So, the collective unconsciouis includes the archetypes (Self, Shadow, Animus, Anima)... but it does not include the 'personal psyche' as suggested by your picture! Therefore your picture is misleading... in the sense that your picture suggests various interactions between features that were actually defined by Jung to represent SEPERATE features of the psyche. For example: you picture suggests that the collective unconscious can manifest in the persona or vice versa... but that is not what Jung described at all. "Anyone who wants to know the human psyche will learn next to nothing from experimental psychology. He would be better advised to abandon exact science, put away his scholar's gown, bid farewell to his study, and wander with human heart throughout the world." - CARL JUNG, "New Paths in Psychology"
Jung's theory is not one that a person can argue with facts, but needs to be felt with the heart. Here Jung describes how he sees the Psyche not entirely bound by time and space. It is abstract. The Collective UnConscious straddles the Inner and Outer worlds (in my graphic). It draws from the physical in the form of our life force energy, our blood and our breath. The air is drawn from outside the body into the body into our blood. The Personal Unconscious is at the center of the Self and the Self is at the center of the Psyche. It is sort of the gateway between the 4 directions. Inner World, Outer World, Collective Unconscious and Conscious. He placed the Collective Unconscious as the deepest layer. In this sense you move from the center of your psyche to a far reaching corner. He says this is a place where experience isn't the influence. This then is instinct and primal energies and come from the root of the hand. In the paradox, I'm presenting (seeming contradiction) regarding the focus is not from experience and therefore not from the Outer World can be looked at from a newer perspective. New research has shown that infants old enough to reach for things that please them and withdraw or look away from things that don't, have this quality for instinctively knowing how to pick like people and avoid people with different interests. They also can identify with good and bad behavior. This latter test was done with a puppet show. The puppet that was selfish or a bully was not the puppet that the infant reached for (repeatedly) when offered choice between a helpful puppet and a bad puppet. I think the infants were about 3 months old. The older babies chose the puppet that liked the same cereal that they themselves chose in more complex scenarios. Most likely these are instinctive survival skills. This, in my opinion, would support the interaction of the Collective Unconscious with the Outer World. ... we are not really discussing how to interpreate Jung's theory, I have only tried to discuss your interpretation of Jung's theory via the details inside your picture. But apparently it's enough for you that your picture feels okay for you inside your heart. So, to me it appears that you allow yourself to put subjective validation above Jung's descriptions - because I have described that various features inside your picture do not match the 'landscape of the mind' as described by Jung. I preceive your reference to the heart as a reflection that you've put locks at the doors of your mind... and meanwhile your descriptions do not explain your choices regarding your picture at all. You've only managed to describe things in terms of: this is here, and that is there - with no direct reference to Jung's theory at all. So basically, you've used Jung vocabulary inside your picture, but the landscape in your picture does not represent Jung's theory at all... because it appears to violate some of the hierarchic principles described in Jung's theory. It's a bit hard to accept that you didn't acknowledge anything that I have described in my feedback, and I want you to know that after my efforts I can therefore only perceive this topic as a (conscious or unconscious) attempt to substantiate your 'belief' that the thumb represents the inner outer world. ... we am not really discussing how to interpreate Jung's theory, I have only tried to discuss your interpretation of Jung's theory via the details inside your picture. It's a bit hard to accept that you didn't acknowledge anything that I have described in my feedback, and I want you to know that after my efforts I can therefore only perceive this topic as a (conscious or unconscious) attempt to substantiate your 'belief' that the thumb represents the inner world. Did you just project the Thumb and the Inner World onto me? I uploaded in your thread a page from Fred Getting's "Book of the Hand". I agree with Gettings that the thumb represents how we put our inner self out into the external world. Or was that a Freudian slip? I have addressed all of your questions. Maybe this quote from Jung will help. "The psyche is far from being a homogeneous unit - on the contrary, it is a boiling cauldron of contradictory impulses, inhibitions, and affects, and for many people the conflict between them is so insupportable that they even wish for the deliverance preached by theologians. Deliverance from what? Obviously, from a highly questionable psychic state. The unity of consciousness or of the so-called personality is not a reality at all but a desideratum."